Having a small bedroom isn’t the end of the world. Yes, seriously. And I know, we don’t just sleep there. But armed with a little creative thinking, you can turn your tiny boudoir into a special space with these small bedroom ideas that are big on style! Take these ideas one at a time and address your small bedroom design, storage, layout, and furniture choices to makeover your tiny bedroom space. One of the first things to remember when decorating a small bedroom, is that the design of the room is everything. Because your eye takes in a small space all at once, you need to pay extra attention to the design. This is good thing! Because your space is small, you can direct attention to one or two focal points, and spend less money while doing it. Smaller room, less to buy! Here are some easy small bedroom design ideas that are sure to make the most of what you’ve got! Photo by ‘HGTV‘. In a small bedroom, the bed becomes the most important element. So focus your attention on making it amazing. Bedding, pillows, and the bed frame itself are the most important items in the room. 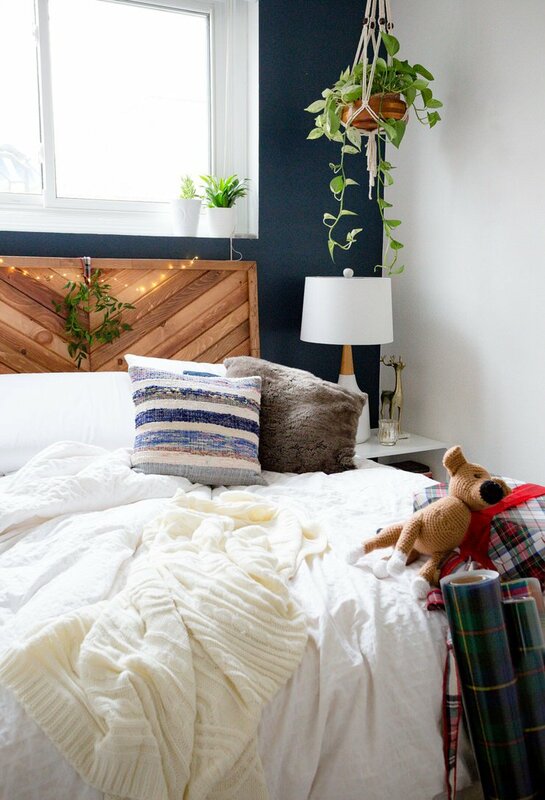 (Check out our post on TBD on DIY Bed Frames!) From a design standpoint, making the bed the focal point of a small bedroom makes the rest of the decorating job easy. And, if you love your sleep like we do, don’t skimp on the bed folks. Really, you spend a third of your life there. Find the perfect pillows for your aching neck. Do what it takes, find those pillows! Buy beautiful bedding that is soft to the touch. If you are decorating a small bedroom, we recommend you stick to a calming, continuous palette throughout the room, including the bedding. With one, very important exception. 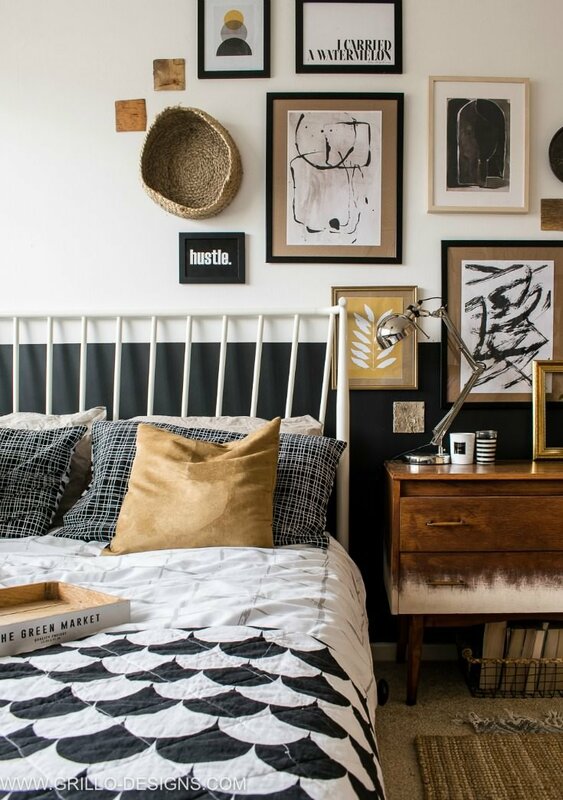 You need a statement piece on the bed to keep the room from becoming boring. Just one statement piece will take your bed (focal point, remember) to amazing, which means, the room is amazing. I love a strong navy and white pattered throw or rug. You could also wallpaper the wall behind the bed in a trendy graphic. Or if you aren’t into a pop of contrast and color, add texture. 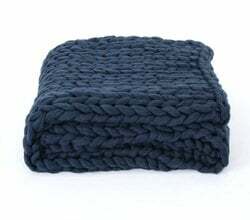 A chunky knit throw blanket will do the trick! ‘Emily Henderson‘ is one of my design crushes. Seriously, her style! This is one of her latest bedroom reveals, and it is awesome. The entire bedroom is white, then this gorgeous pop of navy and white on the bed. Getting it? Make the bed the star! The Northville Reversible Duvet from ‘Wayfair. 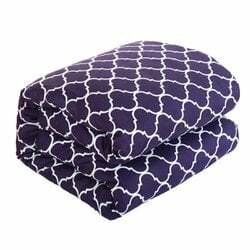 Perfect graphic navy and white pattern to go with all white bedding! We recommend using white pillow shams as Emily did above. You don’t want too much of a good thing! 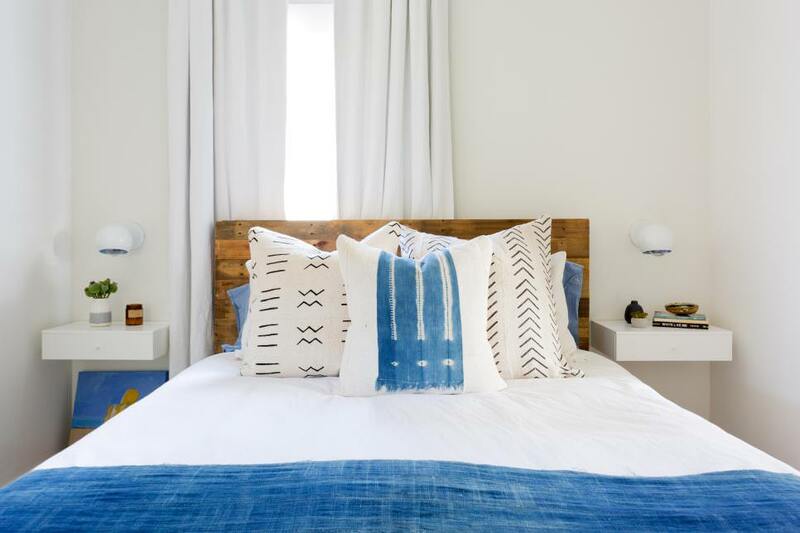 If you want to keep the bed more calm and quiet in color and pattern, consider adding that pop on the floor. Especially with an all white bed, this can look amazing. Place the rug under the bed, but so that enough of the rug shows for it to “showcase” the bed. 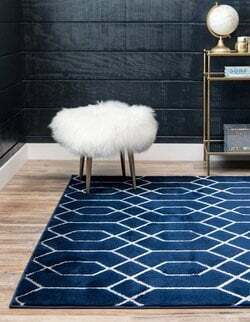 I can’t see how you could go wrong with this navy and white Glam Area Rug from ‘Joss & Main’. Make sure you find yourself a good memory foam mattress. I have had chronic and serious back pain since I was 13 after a horseback riding accident, and I can’t sleep well on anything but memory foam. At the very least, get a good memory foam mattress topper. If you need a whole new mattress, we like the ‘Nectar‘ memory foam mattresses. They come with a 365 night guarantee, how can you beat that! And if you want a good memory foam mattress pad, we love the Lucid 4 inch mattress topper, sold at ‘Wayfair‘. Not to sound like a commercial, but this is like sleeping on a cloud. Don’t want a tiny bed? Yea, that wouldn’t work for me & Steve either. You don’t have too shrink the bed to create an amazing small bedroom. The room is small anyway, so as long as you have room for nightstands and 18 inches clearance between the bed and the wall, go for it. Sometimes in a small bedroom, you just don’t have room for a dresser, armoire, or any other kind of storage. Ah, but you do! Consider the star of the show, the bed. Underneath said bed you have tons of secret storage space. Don’t want to just shove all your belongings under the bed? Good to hear. 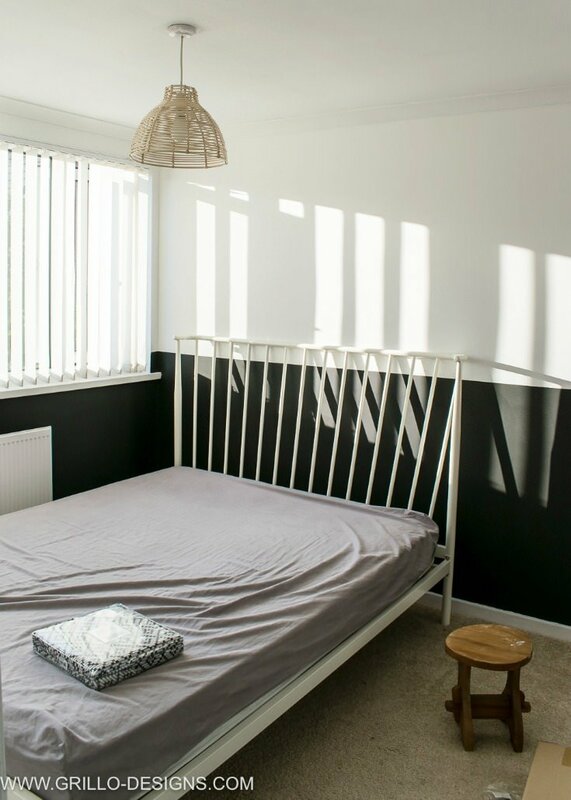 Luckily we have a whole couple of posts over at TBD you might be interested in… DIY Storage Beds, and DIY Under Bed Storage. You can create rolling drawers and other creative solutions for small bedroom storage! Another option is double duty furniture. If you really have a small space, or a double duty room like an office, consider a Murphy Bed. Much more comfortable then a sofa bed, you can use normal memory foam mattresses on these beds, and they fold entirely up into the wall when not in use. Check out our post here on OhMeOhMy on DIY Murphy Beds. Warning – They are a lot of work, but worth it! If you don’t want to go the DIY route, consider buying a Murphy Bed you can install yourself. We like the affordable choices at ‘Wayfair‘ and ‘Overstock‘. Some Murphy beds turn into bookcases, or even home office desks when folded, so consider how you want to use the room. Acevedo Murphy Bed from ‘Wayfair’. Ok, so you have a small bedroom, and right now, you have no idea how to arrange your furniture. Here are a couple of small bedroom layout ideas that will get you thinking about making a change. And sometimes, a small change is all it takes to have a fresh, new room! This is a tiny bedroom with only enough room for a bed and two nightstands. (And one is sideways!) Never, I mean never, shove your bed into the corner to make more space in the middle of the room. It doesn’t pay when you are the one who has to climb over in the middle of the night. Take advantage of the space at the end of the bed to place a small storage bench. This gives you extra space to store pillows, extra blankets, or even out of season clothes. You can make your own DIY storage bench, or pick one up at ‘Wayfair‘. Totally worth it. It gives you a place to sit and put on your socks, and what small bedroom doesn’t need more storage? Photo by ‘My Domaine‘. This small bedroom layout is from ‘Apartment Therapy‘. In this arrangement, they got rid of one of the nightstands in favor of a dresser instead. They can still use the dresser top as a nightstand if needed, but now they have a place for more clothes storage. Ok, so now I know you are feeling the need for some bedroom inspiration, am I right? No prob. 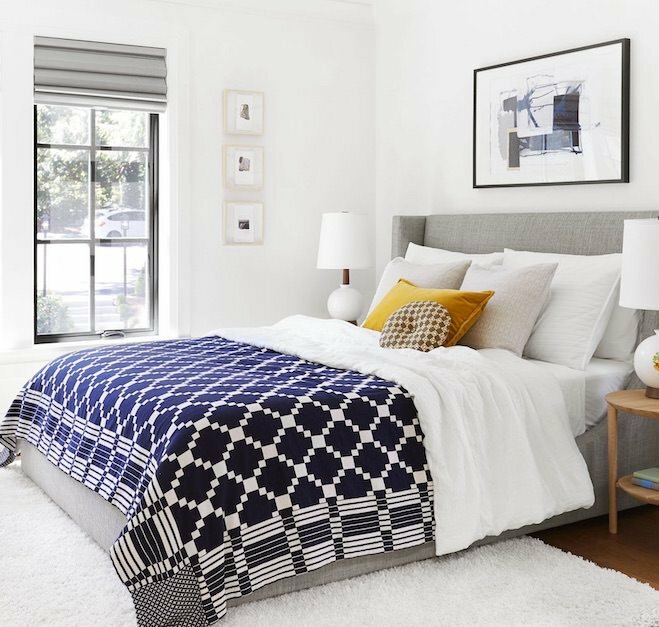 These small bedroom makeovers & ideas will have you running to the store, pulling out the paintbrushes and moving around the furniture! 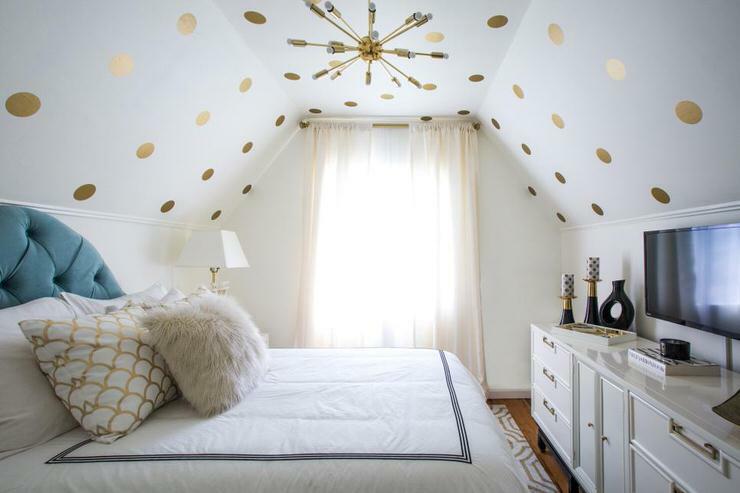 This first modern vintage bedroom makeover is from ‘Grillo Designs‘. She took a tiny box of bedroom, made the bed the star (notice the coverlet!) and added tons of neutral, but interesting details full of texture and style. 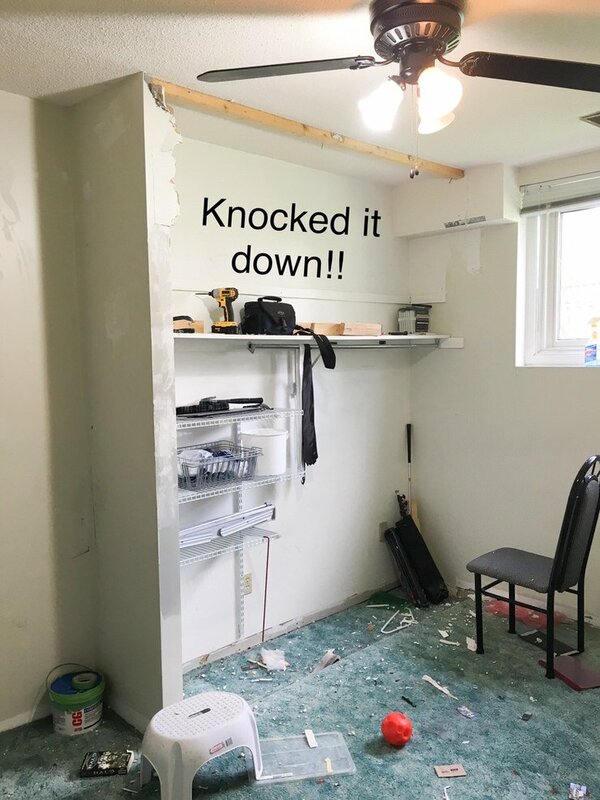 Check out this before and after! 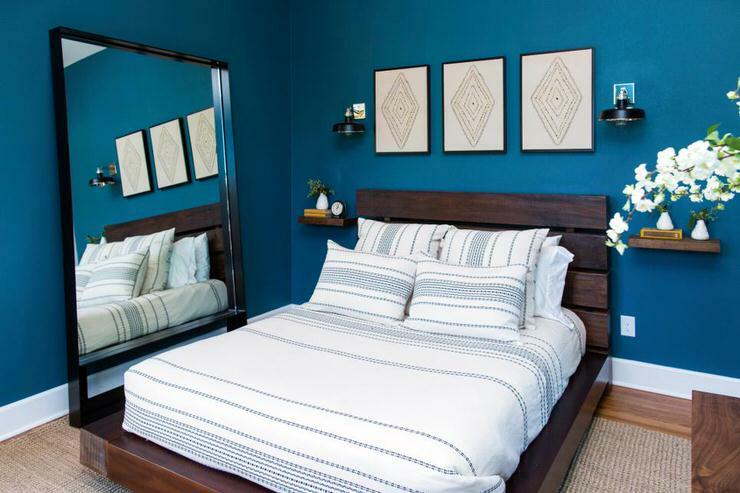 This bedroom from ‘HGTV‘ had its heavy furniture replaced with floating nightstands. You could put pretty baskets under the nightstands for more storage. Notice the light fixtures mounted on the wall to give more space on the nightstands. 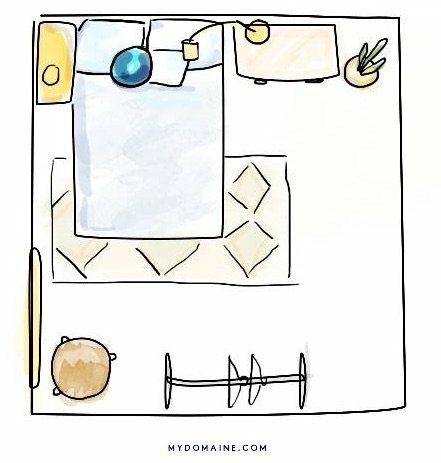 Can you tell where the “wow” is in this small bedroom? From ‘HGTV‘. Lucy at ‘Craftberry Bush‘ has this amazing rustic Mid Century bedroom makeover. She took it from a demolition zone, to the prettiest small bedroom! Go check out all the other photos in this fabulous before and after! Enough small bedroom ideas for you to get yourself started? We think you will also love our posts on Kids Rooms : Shared Bedroom Ideas, and Starry String Light Decor & Ideas!